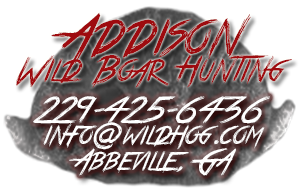 Addison Wild Boar Hunting, Inc is a family owned outdoor sporting expedition company with generations of experience. The natural beauty of the Ocmulgee River and the unbridled excitement of bagging a trophy wild hog(or a meat hog) are just a part of your hunting experience. Our 1300 acres can be the scene for the hunting expedition of a lifetime for you, your group, your father/son team, or up to 12 members of your group. Our guides are highly qualified, well trained and dedicated outdoorsman. Bob Addison and his staff will be with you and share their expertise every step of the way. We offer a fully equipped hunting lodge and some of the best “Down Home” cooking you can find. The Addision family Southern Hospitality is of the finest in the south. Come join us for a true Hunter’s Paradise! Thanks for the great hunt back in January. Thank you for a great hunt, good food, good company. We will be back next year. Thank you for letting me and my dad come out to the lodge. I think that's probably one of my favorite places to be. That was my best birthday present ever! I hope to see ya'll again soon. Thanks for a great hunt and a great time. Enjoyed meeting everyone and looking forward to next year. Thanks again for the hospitality. We sure enjoyed ourselves and won't soon forget that 500 pound boar that Mike took with his longbow. We will see ya again soon. Bubba, good hunting and good time. Thanks for an excellent hunt, you and Brett are real pros. We won't hunt pigs anywhere else. keep it real! Thanks Bubba, I had one of the most entertaining times of my life at your place. Your guys fed and treated us like kings. My dad and I have come down several times and really enjoyed ourselves... thanks for the great memories and I hope to come down and hunt again in the near future.